Christopher Makowski, Charles W. Finkl, "Impacts of Invasive Species on Coastal Environments: Coasts in Crisis"
This book focuses on the global threats to coastal environments from invasive, non-native species and examines how these alien biological species adversely alter landscapes and socioeconomic conditions as well as the psychological attitudes and perceptions of local inhabitants and tourists. 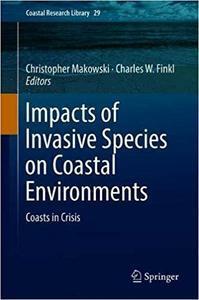 Designed for the professional or specialist in marine science, coastal zone management, biology, and related disciplines, this volume appeals to those not only working directly with invasive flora and fauna species, but also those individuals involved in a wide array of coastal related fields. Examples and case studies of coastal invasive species are drawn from many different geographic areas worldwide, including North and South America, Europe, Oceania, the Caribbean, Southeast Asia, and Africa.